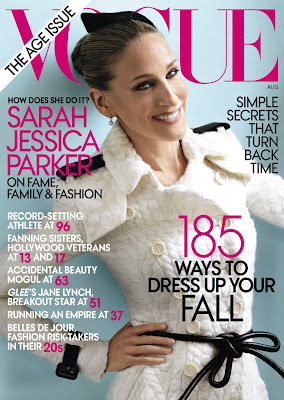 Lush Fab Glam Inspired Lifestyle For The Modern Woman: Sarah Jessica Parker Does The Fashionable Mom Show & Tell for Vogue! Sarah Jessica Parker Does The Fashionable Mom Show & Tell for Vogue! Actress Sarah Jessica Parker covers the August 2011 issue of Vogue magazine and shows us how to juggle fame, family and fashion. The photo-spread by Mario Testino features actress SJP, her husband Matthew Broderick and their children. Only Vogue would think that any mom can look this put together and uber-chic while balancing the life of being a mother, a professional and a wife. This one is dedicated to all our readers who are moms and would love to live the fairy tale fashionable mom story. What do you think of Sarah Jessica Parker's Vogue Photo-spread? Leave a comment below. Sorry but I don't find her pretty at all. I wish taking care of kids looked this good lol. Those are some messy kids,luv her clothes.